The Redemptorists of the Baltimore Province are pleased to announce an agreement with Church Communities to lease Mount St. Alphonsus Retreat Center on Route 9W in Esopus, NY. Church Communities will move in by February 1, 2012 and plans to continue the use of the existing facilities as a religious community and educational center. Some of the property will be used for farming, which hearkens back to the days when Redemptorists first worked the land when it served as the congregation’s North American seminary. The chapel’s stained glass windows, a very visible representation of the Mount’s Redemptorist history, will remain along with much of the original construction and décor. A perpetual easement for the cemetery will guarantee continued access to and use of the burial ground by the Redemptorists. During a transition period, the Redemptorists will continue to use the gatehouse. The Redemptoristines, a group of contemplative Catholic nuns, also will continue to occupy their convent, which is located on the property. Built between 1904 and 1907, the Mount opened in 1908 as the Redemptorists’ North American House of Studies. In addition to being a place of study, Mount St. Alphonsus was a self-sustaining property — the Redemptorist brothers farmed and raised animals for their own food. Since 1985, when the students relocated to Washington, D.C., the Mount has served as a retreat center. In February 2011, the Redemptorists announced that they would cease retreat operations at the Mount in January 2012 due to changing ministry demands and an aging membership. Church Communities, also known as the Bruderhof, is an international network of Christian communities originating in 1921 in Germany. Its first community in the United States, Woodcrest, was established in nearby Rifton, NY in 1954. Members take Jesus Christ and the early Christian church as their example for daily living. 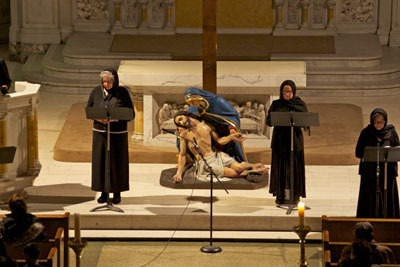 On the evening of Good Friday, against the stark background of an empty tabernacle, bare altar, and a statue of the Pieta, a group of performers, under the direction of Father Lenny Delgado, presented a series of reflections on the crucifixion as seen through the eyes of the women of the New Testament. The sanctuary of Immaculate Conception Church in the Bronx, NY, provided the setting for the prayerful reading. Readers participating in the Good Friday reflection. Fr. 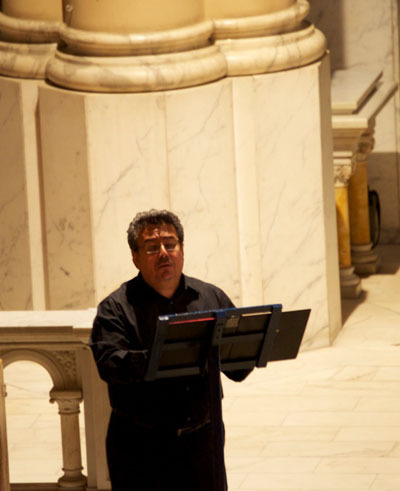 Lenny Delgado leading the reflections.